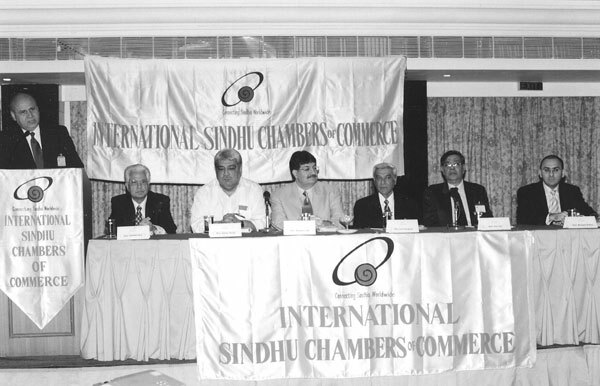 I was invited in my capacity as Editor of Sindhishaan, to attend a General Body Meeting of International Sindhu Chamber of Commerce (ISCC) held in Mumbai on 4th May 2003. The concept of connecting Sindhis worldwide to promote trade and commerce really got me excited and I carried an article in the Jul-Sept. issue of Sindhishaan. The concept of Sindhi Entrepreneurs worldwide, giving preference to co-members of the Chamber for business enhancement seemed truly a fantastic and worthy cause, and I promised myself to keep a track of the progress and the initiatives taken by ISCC. I must confess here that Sindhishaan is not my mainstay business, but more of a passion, and as such my intention of keeping in touch with ISCC, unfortunately, remained just a priority on my “To Do” list. Let’s face it after all it is my regular business that allows me to indulge in my “junoon”. 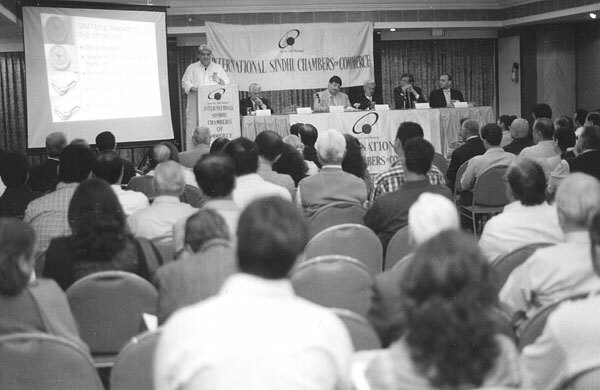 In October 2003 I was appointed the Indian Representative of Indian Chamber of Commerce in Italy (ICCI), based in Milan, and was given a very short notice to organize a trade meet in Mumbai in early December. The visiting delegation comprised of 18 Italian entrepreneurs from diverse sectors like furniture, costume jewellery, handicrafts and cosmetics besides the engineering and automobile sector. The 3 day meet between the Italian entrepreneurs and Indian counterparts turned out to be a great success and it was concluded that four such business meets be held in 2004 to promote bilateral trade between India and Italy. This immediately triggered my memory and initiative to attempt participation by members of International Sindhu Chamber of Commerce in the forthcoming trade meets and I sent a message to the ISCC office in Pune on 8th December to this effect. I was rather pleased by the prompt response when I got a call from Shri Ashok Kamdar – Chairman Programme Committee ISCC on 12th December, but the conversation veered on to a totally different subject – an invitation to be one of the keynote speakers at the seminar on the subject, “Global Opportunities & Challenges For Sindhi Entrepreneurs In The Present Economic Scenario”. As I was travelling overseas that very evening, I requested Shri Ashok Kamdar to send me a detailed fax and promised to revert on my return on 23rd December. Promptly on my return I got another call from Shri Kamdar, reminding me to attend the seminar on 28th December at Pune; and inspite of my best efforts to wriggle out on account of personal engagements Shri Kamdar ensured that I made a commitment and I failed to counter his persuasive skills. So on the morning of the last Sunday of the year I drove down to Pune and the warmth with which I was received by Shri Kamdar and Shri Lalit Sangtani – President of ISCC, made me feel extremely glad that I had not been able to convince Shri Kamdar to condone my absence. The title for the workshop still remains for me somewhat of an anomaly, for I have always believed that Sindhis don’t wait for opportunities — they create them. And they create them under challenging situations. There is a Sindhi song which we invariably hear at most of the community cultural gatherings, which goes like this — ‘aandhia main jyot jalaiyan vara Sindhi, khak maan sone banaiyain vara Sindhi’. Circumstances and experience have taught the Sindhis to survive – survive till the time is right to strike, then strike and make a grand success of it. So in my mind the subject title could have more aptly been, “Further Opportunities for Growth and Diversification for Sindhi Entrepreneurs in the Present Economic Scenario”. Being familiar with the Indian scenario, I will restrict myself to opportunities in India and my friends – keynote speakers Mr. Raj Bhojwani from Nigeria, Mr. K.P. Daswani from Hongkong and Kishor Moorjani from Taiwan could enlighten us more on the global aspects. To begin with, let us first reflect on the inherent traits and characteristics of the Sindhi. What strikes everyone at once is the Sindhi Diaspora. The community is probably one of the most widely spread communities in the world. Then the quality deeply ingrained in the Sindhi psyche is ‘hospitality’. I will digress at the point to tell you how these two – diaspora and hospitality are interlinked. It may not be a fact, but it is part of Sindhi lore, which was also depicted by Sindhishaan in the first episode of the first ever sponsored Sindhi serial – “Sindhyun Ja Mela” which was telecast on Doordarshan. The story goes something like this — A holy man and his disciple who kept wandering all over the country found themselves once, tired, hungry and thirsty in a prosperous village. At the request of the disciple to the passers-by to arrange some food and water for the holy man, the response received was, “go get yourself some food from the market and water from the well close by”. On hearing this, the he got up to leave; whereupon the passers-by held him back saying, “You are a holy man and you cannot leave without giving us your blessings”. The holy man raised his hands and blessed the village folk saying, “May you prosper and thrive and forever be happy in this very place and for generations continue to live here in peace”. With diaspora is also interlinked the trait of making friends easily and towards becoming extroverts. Uprooted from their homeland, the Sindhis had no option but to adapt themselves to strange lands and quickly make friends with new neighbours. The second characteristic of the Sindhi is that he is ‘adventurous and hardworking’. This is evident from the travels of ‘Sindhworkis’, who sailed all over the globe, leaving their home and hearth behind, for trade and commerce and the purpose of earning their livelihood. As such they were not averse to taking calculated risks and travelling far and wide to promote their business. The other unique quality of the Sindhi is ‘being good at networking and innovative’. The innovative concept of banking and transferring funds by means of the Shikarpuri Hundi is well known by now, and still amazes economists for its unique system of networking. All these qualities have enabled the Sindhi entrepreneur to carve out a niche for himself in the TRADING SECTOR. Sindhi traders have been pioneers in establishing this activity all over the globe, leading to the establishment of large trading houses. Till recently we have had very few Sindhis venturing into manufacturing and the industrial sector. But today we find the younger generation venturing into diverse businesses like IT, Fashion Designing, Film making, etc. But considering the inherent traits and qualities that I have enumerated earlier, I foresee tremendous growth opportunities for Sindhi entrepreneurs in the Hospitality sector. By the hospitality sector I mean Travel & Tourism. Besides the 30 million domestic tourists, India expects to receive 3 million International tourists in the year 2003. It would be pertinent to note here that a tiny country like Cambodia receives as many tourists with only one major tourist attraction which is ‘Angkor Wat’. Even Thailand and Malaysia receive almost 3 times more. And what is more amazing is Dubai attracts 27 million tourists and China 32 million annually. Admittedly upto now, basic infrastructure in the country like National Highways, communications, etc was poor. But all this has changed considerably. And I see no reason why the following targets set out are not achieved. It is thus observed that over the next 10 years, India’s Travel & Tourism industry is expected to achieve an annualized Real Growth Rate of 8.9%. Besides the economic potential and impact on the economy, since travel and tourism touches all sectors of the economy, its real impact is even greater as highlighted in the chart above, and helps in developing ancillary industry like food processing, handicrafts, etc. This industry also creates more jobs, being labour intensive, and as a majority of the tourist destinations are in the rural sectors, it helps in reduction of population migrating to cities in search of employment. Thus far I have dwelt on the suitability of the intrinsic Sindhi traits and the growth potential of this industry. I now come to the question of timing. Why Now ? • India always had something to offer to everyone – Mountains, Beaches, Wild Life, Historical and Heritage Sites, Temples, Eco-tourism, Sports tourism, but the recent improvement in the infrastructure as stated earlier, has reduced considerably the pain and agony of inland travel, travel related travails like reservations of train tickets, bus tickets, and hotel accommodation on a wider economic scale. Life for the tourist is now much simpler. • Since the last couple of years it is observed that for the first time post-independence, families and the current generation in particular are taking regular holidays, sometimes twice a year, which is a common phenomenon worldwide amongst the developed countries. Fly now Pay later schemes, pay for your holidays in easy installments, etc. are options which were unheard of earlier. The current generation is not hesitant to splurge with plastic money, after all their income levels also are high and the old philosophy – first save then spend doesn’t hold good anymore. These two factors have given a great fillip to the upsurge and created a wide opening for fresh entrepreneurs to enter. I now conclude by listing a few specific avenues for investments. Although a few Sindhis did venture out into this sector and we can name a few landmark properties belonging to Sindhis — Hotel Sun ‘n’ Sand in Mumbai and Sun ‘n’ Sand in Pune (where we have gathered now), Hotel Rosewood and The Retreat in Mumbai etc., the impact has not been anywhere near the successful foray of the Patels in the motel industry in the US of A.
I was pleasantly surprised to learn that the owner of Hotel Radisson in Los Angeles, where the International Sindhi Sammelan was held in 2001, was a Sindhi. Our diaspora could be an advantage and a chain of hotels in India and overseas owned by Sindhi entrepreneurs with a close knit network becomes a very probable and lucrative possibility. We have observed how the tandoori chicken, chicken tikka masala and the curry have become favourites among the British and other nationalities overseas. I am sure Sindhis can come out with a world-beating cuisine comprising Sindhi delights like ‘dal pakwaan’, ‘Sindhi curry’, ‘Seyal Gosht’, etc. I strongly recommend that wives of 5 ISCC members get together and start a restaurant in Pune and encourage it by ensuring that it is frequented by ISCC members for their business entertainment or otherwise. On achieving success, a franchise chain could be established all over India and also overseas. I was surprised to learn that accommodation in the whole of Kerela at the numerous ayurvedic spas is booked till end January 2004. Currently, such like centers, which combine holiday with the rejuvenation of body and soul, are becoming immensely popular and sought after. Classes to teach yoga and meditation and diet regimes to detoxify the body are becoming a way of life with the current generation, in view of the stress and strain brought about by contemporary working and living conditions. And for a Sindhi to wine and dine and make money at the same time, should not seem a bad growth option. One can elaborate further but I can’t have the other guest speakers cutting short their presentations because of my exceeding the time allotted to me. I recall from memory a simple cute toy from times before the advent of the electronic gizmos and high-tech stuff kids are now wont to play with. A foot high plastic balloon like figure in the shape of a roly-poly man with a cherubic smiling countenance. No matter how long you held it down horizontally or tilted it to one side, it sprang back to its upright position the moment you released it, grinning from ear to ear. I can easily associate this with the indomitable spirit of the Sindhis – his capacity and resolve to bounce back in life under any situation and come up a survivor. Not only a survivor but a winner. by doing them the Sindhi way’. Mr. Kamlesh Moorjani addressing the audience at the International Sindhi Chamber of Commerce.